Buying jeans because your friends “like” them? 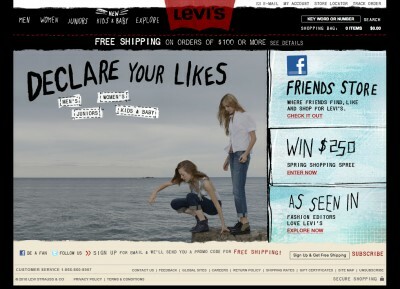 Levi’s partners with Facebook to bring you a unique social shopping experience. 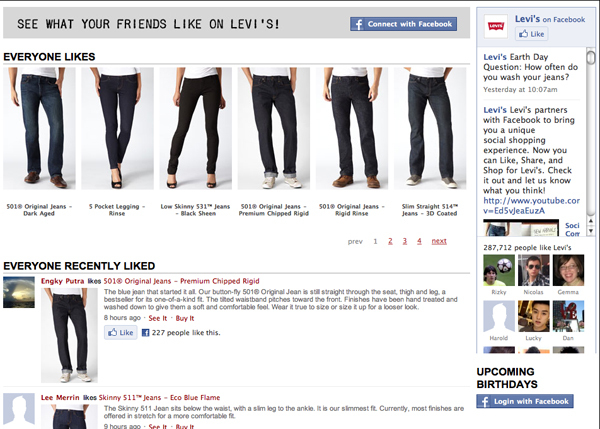 Now you can Like, Share, and Shop for Levi’s. Check it out and let us know what you think! Well, I checked it out and I’m not convinced. Levi’s just seems the wrong product for effective social shopping; even if my facebook friend or friends do like a certain pair of jeans, how does that help me to buy -online – jeans that are right for me? Isn’t it just a basic form of product reviews, but without a scale of “liking” and without any useful and insightful comments? For me, the value of “social shopping” is to a) recreate in the online world the event of going to the high street with friends or b) to spread the word about special and exclusive offers. Levi’s offering doesn’t do either of these. The recreation of real-world high street shopping is much more likely to work with products/ clothes which are more distinctive than mostly blue jeans. The social, viral spreading of special offers becomes effective once it’s beyond the control of the retailer, for example retweeting of offers, or on sites like hotukdeals (as I wrote about here). I do however like how Levi’s integrate their facebook content into the right hand side of the page; much more engaging than the ubiquitous “Join us on facebook” link on most retailers’ sites. And a rather impressive 287,712 fans. 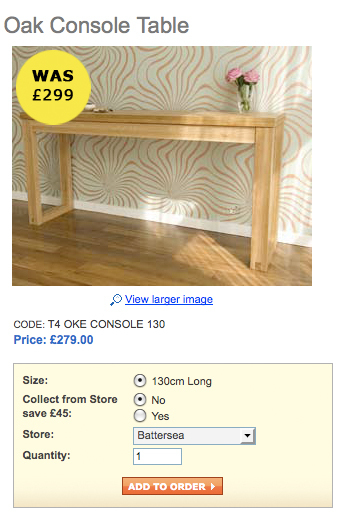 This is an elegant example of offering a “collect in store” option. I think all too often “reserve and collect” on an ecommerce site can be overly complex, with too many checkout stages, an unnecessary search to locate your nearest store, and restrictions on which products can be collected from which stores. The Futon Company admittedly only has 20 or so stores, and probably most orders would be for a single item; the checkout process gets less elegant later on if you want to amend products and delivery options. But I do like the simplicity of presenting the store options on the product page, and how the the benefit (“Collect from Store save £45″) is communicated. This is a question I’ve been asked recently, and the easy answer is anything from £200 up to £2,000,000, with most sites I imagine costing between £2,000 and £20,000. A key factor is the scale of the site (do you have 10 products or 10,000 products) and obviously there is a wide spectrum of ecommerce solutions available, from an off-the-shelf standard template to bespoke solutions, through on-demand and open-source platforms. The total cost comprises upfront costs and monthly/ annual costs, and revenue-sharing can be an option. This is an interesting estimation of the work (in person days) involved in developing an ecommerce site, as taught to ecommerce students at Kingston University, which amounts to 5 months work for one person full time, or more realistically a small agency working on a handful of projects. I have been quoted £20,000 by agencies for a design and ecommerce solution, and then opted to do the design in-house and achieved the same result for £2,000 within 6 weeks with a hosted ecommerce solution. I also see plenty of projects posted on freelance websites like peopleperhour.com where ecommerce sites are built for less than £200. There’s an interesting discussion here amongst ecommerce developers; Should an ecommerce site cost £1,000, £10,000 or £50,000?